Gene editing, shadow governments, nanorobotics, machine telepathy, ancient aliens and fancy futuristic weaponry. Welcome to The Wild Storm. Strap in. This is a long one, folks. 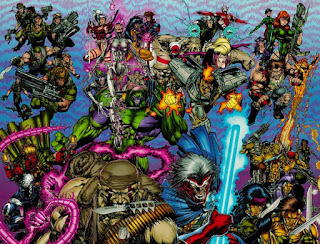 Quick refresher for everyone not as old as I am- WildStorm was a comic publisher founded by Jim Lee and Brandon Choi in 1992 as part of Image Comics. It mainly featured superheroes and villains that gained their powers through clandestine government agencies and the Earth was a battleground in a war between two alien races, the angelic Kherubim and the demonic Daemonites. 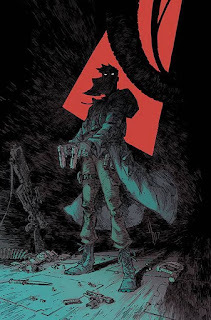 There were other titles, like The Maxx, Red and Battle Chasers, but most of the stories set in this universe were part of the Kherubim-Daemonite war and it's fallout. The 1990s was weird, loud and full of gritting teeth. WildStorm was acquired by DC Comics in 1999. They have been using characters from this universe and actually made WildStorm a part of the DC Multiverse in 2006 as Earth 50. 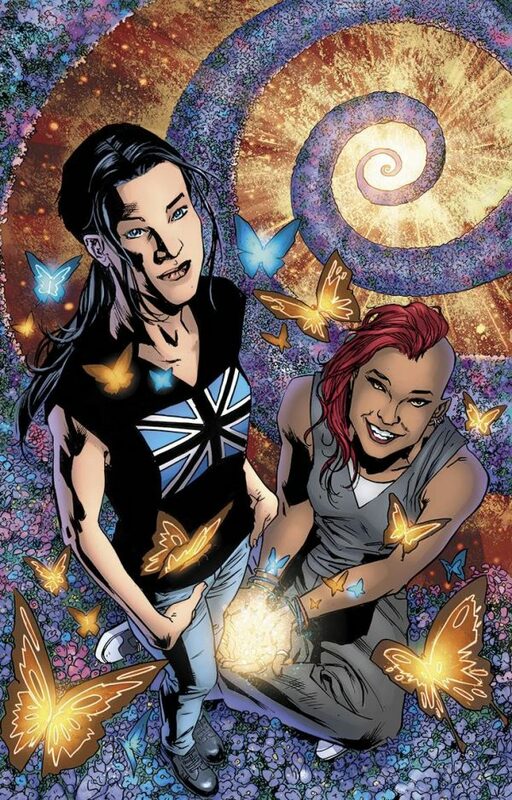 Ultimately, the WildStorm imprint was shut down in 2010. DC Comics shuffles around its multiverse some more with New 52 and now Rebirth. 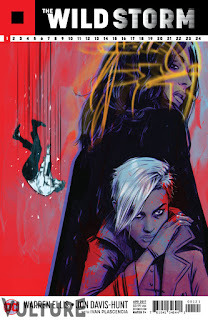 Stormwatch and a few select characters survive but ultimately WildStorm is now more. Fast-forward to 2017. 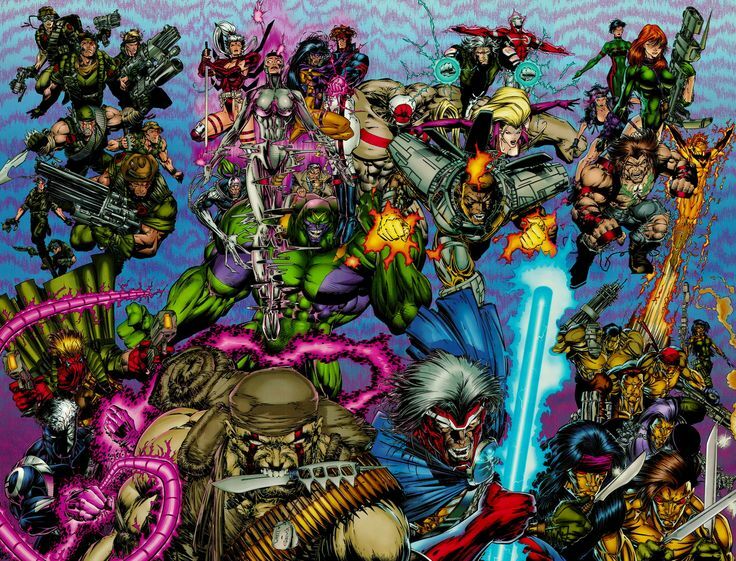 25 years have passed since Wildstorm stories first made their appearance on comic book shelves. Now is a perfect time to start up these weird stories about secret government agencies and aliens hiding among us with weird abilities. It's eerily like our reality. The Wild Storm has begun again under the experienced hand of writer Warren Ellis. Having a familiarity with some of the characters is helpful but not really necessary since Ellis seems to be tweaking the story and motivation a bit. We are pretty much tossed into the deep end of the pool with the first issue. Lucy Blaze is an agent with the code name of Zealot working under Division which we will learn is the ground operations group for Skywatch. She has just killed a person involved in genetic editing in a building in New York City, which we know because the man's hand has eight fingers. Basically, Lucy is a clean up agent for weird stuff on Earth for the secret global organization that controls space. Well, if Skywatch controls the space above us, who controls the actual Earth? That would be International Operations, a clandestine intergovernmental agency started in the 1950s which has treaties with Skywatch on the running of Earth. I.O. monitors situations on the ground and removes people that know too much. The director of I.O. is Miles Craven who we meet pretty much right after Lucy leaves her mission. He is a shrewd man and always plotting for more power which is the same agenda as the Miles Craven from the original WildStorm stories. He is having lunch with his husband when they are interrupted by one of I.O. 's researchers, a medical engineer named Angela Spica. Angela is a smart woman but appears to be rambling and out of her head about something. She is requesting more equipment and funding from Craven who is trying to ignore her and push her away. Angela wants to use the resources that I.O. has gathered to make the world a better place. Ultimately, he is successful and Angela goes on her way down the New York street. Suddenly, a man busts out of a skyscraper building and begins to fall to the pavement. This is when the story truly begins to move. Engineer's transformation is a little more gruesome this time around. 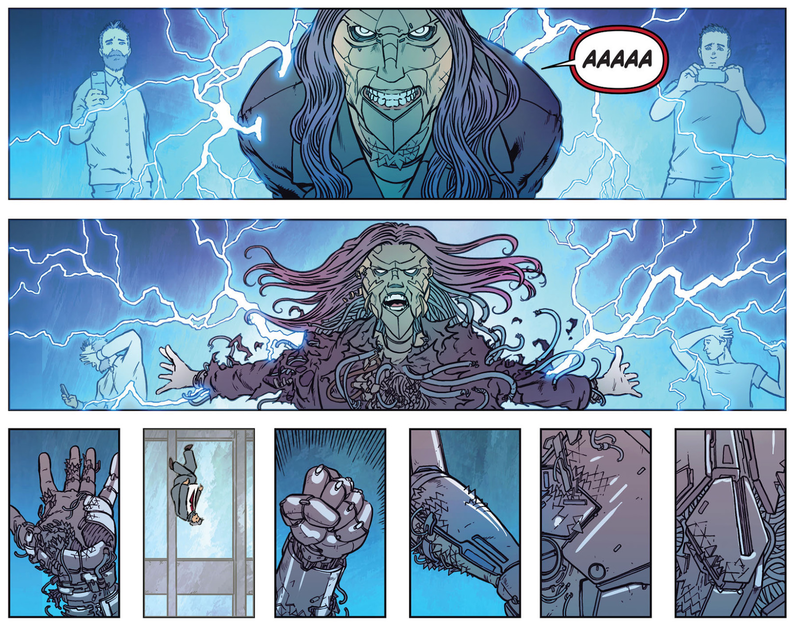 Angela has a suit of armor rip out of her body and she saves the falling man, revealing herself to the world including I.O. and Skywatch. The man she saves is Jacob Marlowe, the CEO of the technology company HALO. Marlowe is an inventor who is giving new technology to humanity. He is also a target for the I.O. assassin Michael Cray. And an alien. For those familiar with the history of WildStorm comic books this isn't new knowledge. We know Marlowe is an alien who has lived on this planet for many years. 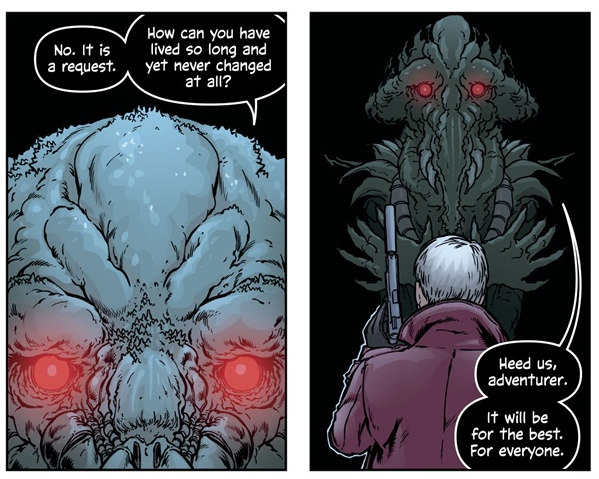 This time around the issue is what is the goal of Marlowe and all of the aliens now? What is the Main Project? I really like where Warren Ellis could potentially go with this story. There are things that I think I know from what I read in the 1990s but I'm sure that there will definitely be differences and massive changes to plot. 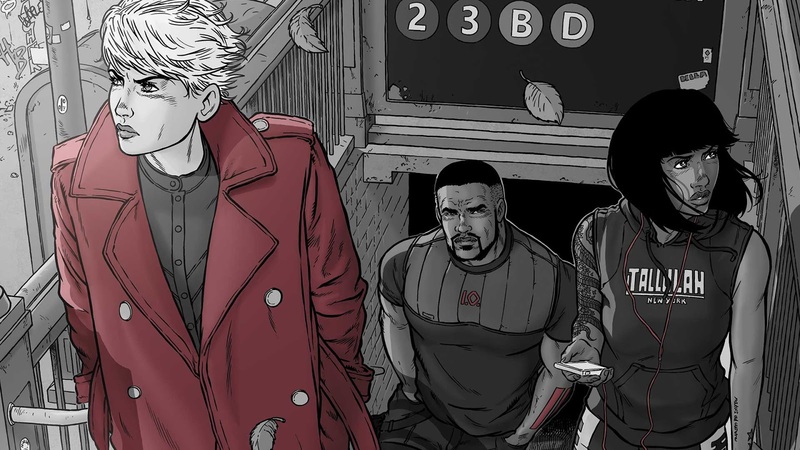 The massive amount of story and characters from the original WildStorm run can be daunting and headacheinducing but winnowing it down to a concrete central story with spooky connections and dark machinations by secret organizations can make this a series to read, including the future connected books. 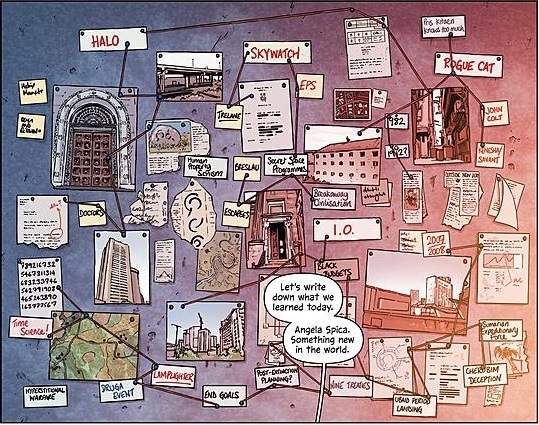 Jenny Sparks is trying to figure it out as well in the 3rd issue. 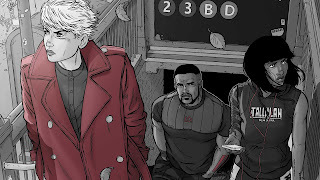 So, let's rundown what we do know so far with the initial 8 issues and the issue 1 of Wildstorm: Michael Cray. Thousands of years ago, a group of aliens came to Earth in an exploratory vessel. Their mission was to help humanity get pass the Gaian Bottleneck, a point where civilizations end. We are told that the aliens were represented by 5 different groups that I could guess at but might be wrong. We know for sure that Marlowe and his allies Kenesha and John Colt are two different types of aliens. The creatures known as Daemons also appear but the information on them is light right now except that Lucy Blaze knows of their existence, they exist in Jenny Sparks mindscape and Priscilla Kitaen has a right arm that is identical to a Daemon's appendage. Of course, all this information on the alien expedition is coming from Marlowe and we learn that it is a partial truth at best. On top of all this is International Operations which started Skywatch until that organization broke off as a separate entity to control the skies. I.O. is run by the aforementioned Miles Craven. He is assisted by the ruthless Ivana Baiul and I.O. Chief of Analysis Jacklyn King, Ellis' new take on the original character of Jackson King. I.O. also have covert action teams or CATs that operate in groups of 2 called Warblade Units or more with operatives called Razors. Old or alien. Or both. Skywatch is mostly concerned with space and is under the control of Director Henry Bendix who is old, hates being on Earth and is possibly also an alien. He is assisted by the sarcastic Lauren Pennington and has Christine Trelane operating Division, Skywatch's ground operations. She is also in charge of Executive Protection Services which seems to be a front for Division. Lucy Blaze works under Trelane as does Michael Cray. Cray has just been let go by I.O., avoided an assassination attempt by a Warblade Unit, has matter melting powers possibly connected to his inoperable brain tumor and is planning the assassination of the insane billionaire Oliver Queen now. Oh, and Lucy Blaze may be an ancient alien as well. Then there is Marlowe's associates, now including Angela Spica and her armor. There are the two aliens Kenesha who is a tech genius and John Colt, a "man" who infiltrated a secure I.O. facility by himself to gain secrets. He appears to be an excellent strategist trying to figure out what the actions of I.O. means and how they will affect Marlowe's Main Project. Marlowe also has two former operatives from Skywatch and I.O. on his team or WildCAT. Adrianna Tereshkova was a former astronaut from Skywatch who gained powers from a Incision System test which was meant to determine if teleportation in space was viable beyond transport between Earth and the Skywatch orbital base. Adrianna and her whole team were killed. 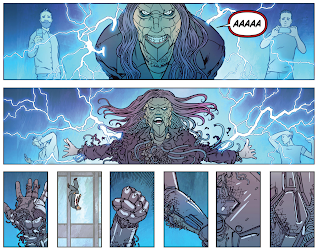 She was reanimated by some outside for with a silver body under human skin, white eyes and the ability to teleport through the under space of the universe called The Bleed. Lastly, we have Cole Cash aka Grifter. Cash was a former I.O. operative that they thought died on a mission (which may be an allusion to Cole's original history as a member of Team 7) but has reappeared as the leader of the WildCAT. Finally, we have folks that we haven't determined loyalty for yet. First is Priscilla Kitaen, aka the famous singer Voodoo who has a history with I.O. but the exact nature of this is unknown at the time. She also knows secret history of places such as the fact that a UFO once landed in Times Square and the location of an "alley down here where a guy turned into a bat in 1939" which is a reference to Batman's first appearance in Detective Comics #27. Next we meet Jenny Mei Sparks who appears to be able to travel through electronic devices and is investigating the connections of this entire world. She seems to be part of a line of technology based individuals that appear in times of danger towards the Earth and has some connection with Daemons. Her forebear was a woman named Joan Silver who was an alchemist. We get that last piece of information from a visit that is taken by a woman to a group of Doctors from the past. The Doctors are shamans on mankind that go back in time to the beginnings of our species. All the past Doctors still are able to communicate in this realm to give knowledge to the current Doctor, like a form of racial memory. The current Doctor is Shen Li-Men, a hipsterish woman who passes out egg shaped "drugs" that give hallucinatory visions and allows her to heal people. Shen was originally a winged hero named Swift, a member of the Authority but it appears that has been combined with the figure of The Doctor to give us this new iteration. She even has glowing wings in the hallucinating state of her patients which is very cool in my humble opinion. There is a lot of framework that Warren Ellis has constructed here. He is world-building with the words and bits that he tells you, even if you aren't always sure about the trustworthiness of the characters. There are also flashes of alien imagery, Voodoo's history/and Lady Backlash Records promotional material and other things that leave you wondering what is next. I think if you were a reader of the old WildStorm books you will be easily engaged with this series. It's fun to see how they characters are portrayed this time around and you get in-jokes like the I.O. 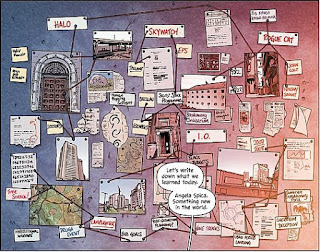 black site being infiltrated like a Spartan by John Colt is called Hightower which was a Daemonite villain's name or Majestic level installations. There are also many DC Comics references like Streaky the Cat being owned by Jackie King and a Doom Patrol television series existing. The DC nods are particularly noticeable in the scenes where Jenny Sparks travels through the electronic pathways. 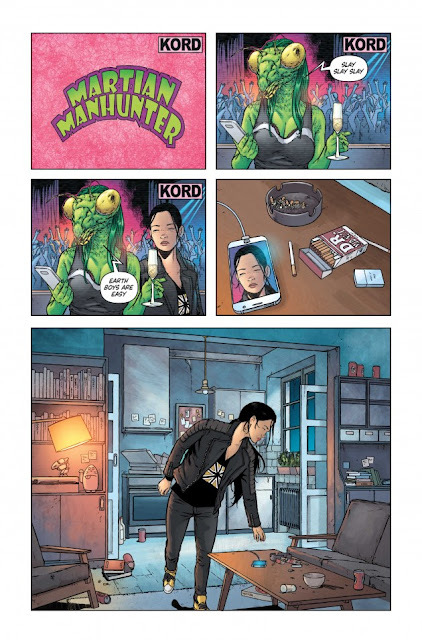 Check out the Martian Manhunter, Kord technology and Doctor Mid-Nite cigarettes in those panels. The lighter also has a Mission To Mars 1955 novel reference. Nerdy. There are a ton of questions that need to be answered. Why did Marlowe and the aliens really arrive here? What is Henry Bendix's goals besides never stepping on the planet Earth again and raining "fire from Heaven" onto I.O. and Miles Craven? What is Voodoo's history? How many DC characters are we going to get in these comic books? I'm also curious about what other series that Warren Ellis will use to tie into the main story. 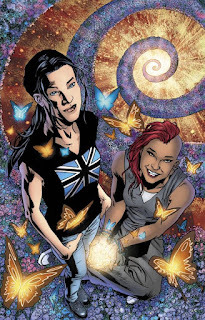 Are we going to see any other Authority members or more Team 7 people or even Gen 13 folks? There is a good base to do some really cool conspiracy stuff and alien secret war stories. Ellis is a good writer of comic books and novels and short stories. I have faith that he will be able to do this quarter century reboot justice. Please reward my faith, Mr. Ellis.